Horses are incredibly intelligent animals, and this playful stallion named Frankie is no exception. He must know that the reporter is talking about him, because everytime he starts his sentence, Frankie nudges, nibbles and bops the reporter with its giant head! 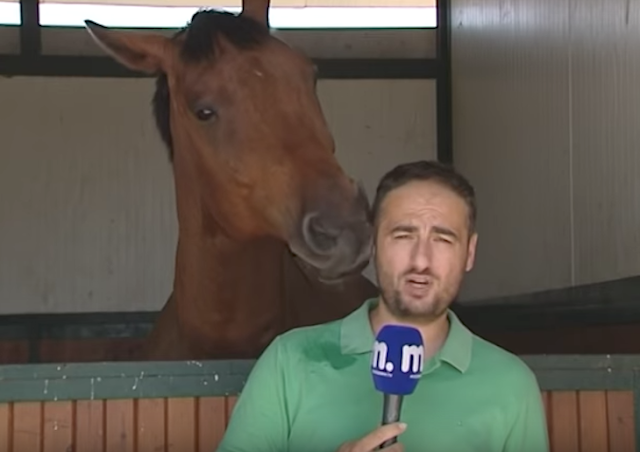 It's impossible not to smile while this horse bugs the reporter for some affection. Thankfully, the reporter is a good sport and isn't afraid of the large, outgoing animal. In fact, he tells the cameraman excitedly, "I want this footage!" His silly interaction with Frankie is something he'll want to giggle over for years to come! 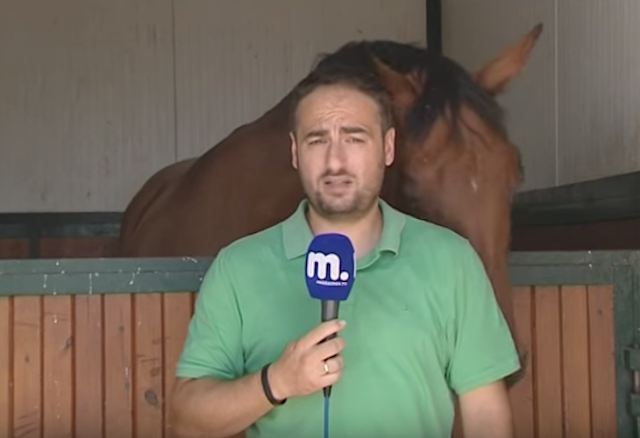 Even when Frankie begins to nibble his ear, the reporter keeps calm and quickly moves out of the way! He's not going to lose an ear today! "Horses can read people like a book. Become conscious of your body language, expression and intention so you can teach your horse to read your actions and intentions and to know whether or not he should be worried. A horse needs a leader - calm, controlled, focused. It is up to us to learn how to become this kind of leader for our horse and even more importantly, how to be his teacher. Then we can teach our horse to become our partner." Frankie is set on pestering the reporter, but the reporter is able to stay relaxed and lets him play as much as he's like! It's clear nothing can get to this man! Watch Frankie playfully pester this reporter for yourself in the hilarious video below! Humans and animals are made to get along like Frankie and this patient reporters - so it's heartwarming to see an interaction between the two go so well!